I stood on a stool when I was a small girl and watched my Mother load jars into a large kettle that set on a small 4 burner stove. I remember how beautiful the jars looked in the sunlight as they cooled on the counter. 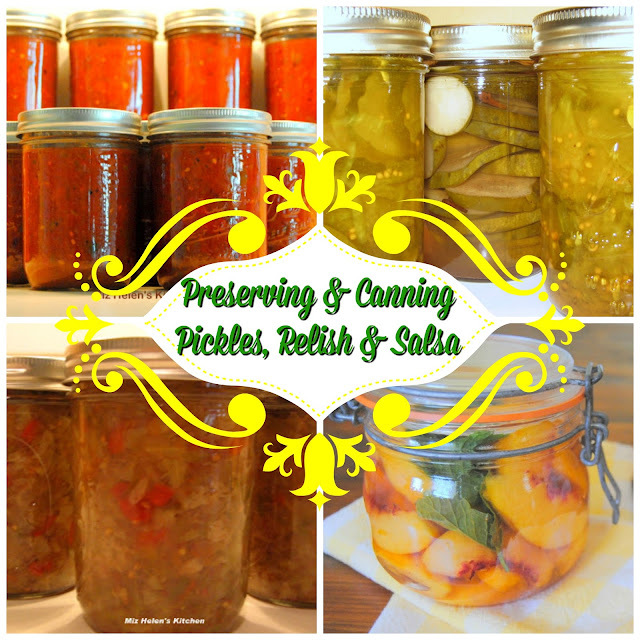 Canning and Preserving food has been a big part of my life growing up and it continues to be today. Canning and Preserving food is almost a lost art in our society today, which makes it important to me to be able to pass these recipes along to friends and family. We are blessed with a bountiful garden that makes it possible for us to preserve and share the harvest. I sure hope that you are able to preserve your harvest whether it be from your own garden or the local farmers market. Thanks so much for stopping by the cottage to visit with us. Hope you have a great week and come back to see us real soon! Your preserved bounty looks like kitchen jewels. Thank you ! I have never tried canning but I have always wanted to. Definitely on my list to try. ;-D Thanks so much for sharing with us at the Whimsical Wednesdays Link Party Miz Helen!